The CoolSign Display Engine supports CoolSign’s DataWatcher™ for dynamic data-driven content, player-level scheduling, up to 8 regions, central management, tickers and full motion 1080p60 video playout. The player also supports live streaming, multicast streams and file distribution, as well as multiple display outputs. 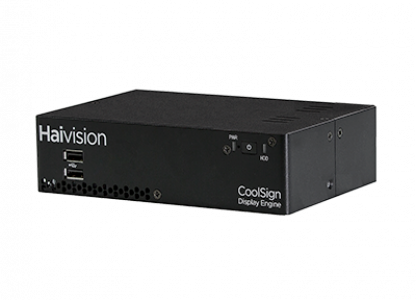 To deliver live video securely within your digital signage network, the CoolSign Display Engine integrates with the Furnace™ IP video system. The Furnace HD video streams are encrypted and cannot be copied, adhering to the copyright requirements of your content providers. Viewership is completely controlled by the Furnace system so facilities and campuses can adhere to content restrictions and include broadcast content confidently within their signage deployment. The CoolSign Display Engine provides superior quality playback of graphics, overlays, and video content. Transitions are seamless with full crossfade capabilities. CoolSign supports sophisticated multi-layer compositing directly at the player level with independent control of all elements. Tickers play at 60 frames per second (fps) full motion with no stuttering.